The chairman of the House intelligence committee has apologised for not informing Democratic colleagues before going public with allegations about surveillance of Donald Trump’s team. 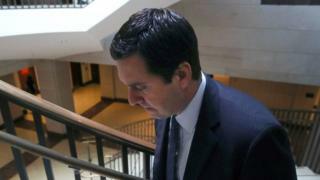 Devin Nunes apologised privately and vowed to work with them on the issue, a committee aide said. Democrats were furious that Mr Nunes went straight to the White House. They questioned whether the panel’s inquiry into Russia’s alleged role in the election can proceed objectively. Could FBI investigation ensnare Trump? Why is Watergate in the news again? On Wednesday, Mr Nunes said he had been passed information showing that the post-election communications of President Donald Trump’s team had been swept up in an “incidental collection” by intelligence agencies. The California Republican stressed the allegation did not back Mr Trump’s claim that former President Barack Obama ordered Trump Tower wiretapped before last November’s vote. The US intelligence agencies regularly, and legally, monitor foreigners, and the communication of Americans is often incidentally collected. They are not usually named but can be if the context of the intelligence requires it. Mr Nunes said the material he had seen “bothered” him and that the unmasking of individuals, and the content of some of the material gathered, was “inappropriate”. Of his decision to go public and brief Mr Trump, Mr Nunes said: “It was a judgment call on my part. Mr Nunes had also stressed that the information in the intercepts he had seen was not linked to an FBI investigation into alleged links between the Trump team and Russian officials during the election campaign. However, Democrats said Mr Nunes’ actions could scupper the House panel’s investigation. Mr Nunes has refused to reveal who passed him the information. When asked whether it was the White House itself, he said he was “not going to ever reveal sources”. Mr Nunes’ disclosure came two days after FBI Director James Comey confirmed the organisation was investigating alleged links between the Trump team and Russian officials. Mr Schiff on Wednesday told MSNBC he believed there was evidence “that is not circumstantial and is very much worthy of an investigation” about the links.